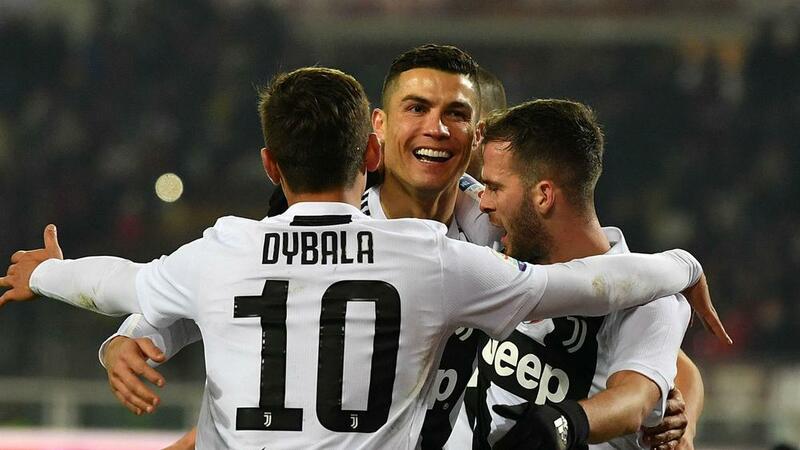 Cristiano Ronaldo's decisive penalty in Juventus' 1-0 Derby della Mole win at Torino was too much for head coach Massimiliano Allegri's nerves to handle. The reigning Serie A champions were below par for long spells in a fractious contest but were handed a chance to claim the three points when home goalkeeper Salvador Ichazo brought down Mario Mandzukic following Simone Zaza's dreadful backpass. Ichazo, who was making a first Serie A appearance for Torino since January 2016, almost made himself the hero by getting a hand to Ronaldo's penalty but it squirmed in. Given the unconvincing nature of the conversion, Allegri probably did himself a favour by turning the other way. “I didn't see the penalty, as I turned my back to it. I very rarely watch the penalties, to be honest,” he told DAZN after an eighth consecutive league win away from home saw his team go 11 points clear of Napoli at the top of the table. "I had asked the team to make a sacrifice. It was not likely to be a game with lots of goals. "When Torino's tempo fell, we took control of the game. "The fact that in the second half we were growing means that we are physically well." Reflecting on his winning goal, Ronaldo stated a choice of power over precision paid dividends. "The keeper did well but I shot the ball with a lot of power, which is why I scored," he told DAZN. "It wasn't easy but we did well and we deserved to win." That was not a view necessarily shared by Torino boss Walter Mazzarri, who was confused as to why VAR was not brought into play when Alex Sandro pulled down Zaza in the Juventus box. "Congratulations to my boys, they are giving me great satisfaction," Mazzarri told DAZN, before assessing the Alex Sandro incident, which occurred when the game was still goalless. "I do not know, tell me if it is a penalty or not," he added. "Maybe the referee could go [to the monitor] and see it with his own eyes."